Across the ages, brides have always carried bunches of flower or adorned their hair with tiny buds on their wedding. Grooms have likewise worn matching flowers on their lapels, said to stem from the early tradition where knights wore the colors of their lady during tournaments. Nowadays, flowers are used reflect the wedding’s motif, spruce up the reception venue and of course, enhance the romantic ambience with their fragrance. To make your wedding fully abloom, listen to the flower experts. Unlike the huge arrangements of before, couples are going for the minimalist style in their arrangements. Now, this doesn’t mean just a stem there and a bloom here. Zenaida Pineda of Rustan’s Flowershop says she would usually advise couples to go for simple designs and achieve a clean and crisp look by using one or two colors for impact. Margie Alcabao of The Flowergirls Flower Shop says couples lean toward structured arrangements with geometrical designs. And for couples who would like to have a garden reception but could not because perhaps of the weather, Joyce Aguilar of 2171 Floral Creations says couples use flowers en masse in their centerpieces to achieve that garden-picked fresh flower arrangement. Brides also go for the minimalist style with their bouquets. Aguilar says the trend for bouquets are hand-tied clusters of single flower type. “Precious pearls or stones can be added to bring luster and glamour to the arrangement,” advises Aguilar. The first time a couple-to-be steps into a flower shop, they are intimidated by the variety of choices. The bride would usually want all the exotic and romantic-sounding flowers in the wedding while the groom probably wouldn’t know the difference between lilacs and French lilacs. In choosing your flowers, first step is to select the ones which represent or complement your wedding’s theme or motif. If you feel that you don’t want to be tied down to your wedding’s colors, find out which flowers are in season. These are cheaper and are in abundance, so you won’t get a frantic call from your florist a few hours before the wedding saying that she can’t source enough flowers for your bouquet. 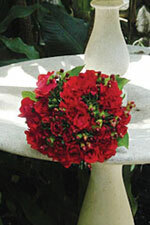 Roses, carnations, liliums, chrysanthemums, gerberas and orchids are available year-round. Everyone’s favorite tulips are imported and are available during the first quarter of the year, along with other imported flowers like hyacinths, lily of the valley and lilacs. Reception Centerpieces – PhP 1, 500 – PhP 5, 500 per centerpiece, together with accessories like candles, mirrors, etc. Bouquets now come in different shapes and styles. To determine the perfect bouquet for you, Alcabao says to make sure to match it with your size, body type, dress design or silhouette. 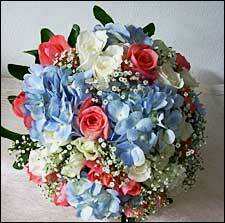 Flowing or Cascade Bouquet– This used to be the common style among Filipino brides. 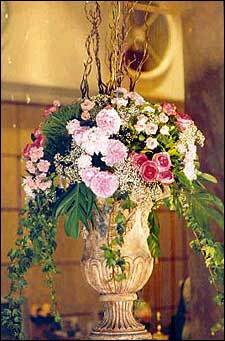 Alcabao describes it as a posy (or bouquet) with flowers trailing towards the ground, creating an inverted tear drop in shape. According to Pineda, this is for gowns with big skirts while Aguilar recommends this for brides with bigger shapes to have an elongated effect. Nosegay – The nosegay is the new favorite among brides. It is a small round cluster of flowers tightly wrapped with ribbon or lace. Pineda says the nosegay is fit for any type of gown, but it should be cut and sized close to the bride’s body type. Hand-tied Posy – consists of a hand-tied compact bunch of flowers. Alcabao says it is the bouquet for brides who are going for theromantic or traditional look. Pineda says this type of bouquet is especially nice for a garden wedding and simple elegant gowns. Pomander – The pomander type of bouquet is perfect for flower girls. It is a bloom-covered ball suspended from a ribbon. Aguilar, Alcabao and Pineda all agree that the couple should book their florist three to six months before the wedding. Or, as soon as the couple has booked a couturier, the church, reception venue, motif and the bride has decided on the style of her wedding gown. Aguilar says this would help the florist design the bouquets and the arrangements.